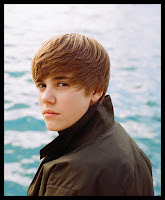 HALLIE: Justin Bieber... what is it with the hair? A comb-forward with heavy bangs and feathered tresses. Watching him on the Grammy Awards I was mesmerized by that hair in motion, reminded of the cast spell over me by Dorothy Hamill. Remember the figure skater whose apparently effortless hair sent us all to the hairdresser in ab out 1970 asking for THAT CUT. I gather it was called a Wedge and it was an aerodynamic masterpiece. Never mind that only about on percent of women had the incredibly thick, straight hair required to pull it off. And five years earlier, perfect hair was Mary Tyler Moore's and "that girl" Margo Thomas's flip. Recently my husband found my high school yearbook for me on eBay. Here was my version of the flip: the helmet-head with wings. Achieving this look required great determination, fortitude, and an unhealthy dose of masochism. First you had to wash your hair. Then comb it out and divide it into segments. Piece by piece, each segment had to be rolled over wire mesh rollers that had prickly brushes stuffed into them. Stab the roller with a long, pink plastic anchors to keep it in place. Then put an enormous shower-cap hair dryer contraption on your head, tucking in bits of tissue around my ears. Turn the thing on high and the cap ballooned out with hot air. Sit there, ears tingling despite the Kleenex, for at least 40 minutes to dry thick hair like mine. By the time you turned off the hairdryer, it felt like a thousand red ants are feasting on your scalp. Then came the only part that actually felt good -- pulling out the anchors and taking out the rollers so that sausage curls sproinged out. Now brush, brush, brush, brush, brush and back comb (aka rat, tease) the hair until it looks like a frizzy mess. I must have looked like Brillo on a Popsicle stick. Then smooth and shape it and Aquanet it to within an inch of its life. To keep it in place required walking without moving the head. What hairstyle tortured you. Was it Bo Derek's beaded cornrows? Farrah's feathered layers? Cher's long, parted in the middle, ironed straight? Meg Ryan's eggbeater? Mia Farrow's pixie cut -- the one that sent Sinatra (hard to believe she was married to Frankie) into a rage? Audrey Hepburn's French twist? Did guys suffer from the same torture trying to emulate Elvis or the Beatles or Jimi Hendrix? Never did the "helmet flip". I did, however, have the long, layered hippie cut that had to be PERFECTLY straight. For me, this meant ironing my hair. Literally. On an ironing board. And I do vaguely remember sleeping with my hair rolled on orange juice cans, although I'm not quite sure what that accomplished. There is something to be said for progress--flat irons! What a great picture, Hallie. I was right there with you. One phase required heavily jelling my shoulder-length hair, shaping it into the flip, and then walking around without moving my head until it dried. In another hair phase the rollers were like Deborah's OJ cans but were even biggger rigid plastic cylinders. You had to wedge your pillow in under one side to sleep. Sheesh! I don't know who I was emulating. The 'popular' girls, probably. I spent my entire four years of high school sleeping in those foam curlers. And it was useless, since my straight hair was determined to resist any persuasion, and that carefully constructed flip wilted by the time I arrived at school. It was such a relief when I got to college and long straight hair was popular, at least for a while. Except my curly-haired roommate slept with her bonnet hair dryer on--all night. Oh, Deborah, I ironed my hair, too. Same year I went to see Janis Joplin at the Filmore West. Edith, you reminded me of the Guiche (not Quiche)! Does anyone remember that? I think there was a foreign film where the actress had this spit curl glued to her cheek and so we did it, too. Using what for stickum? Clear nail polish? Is that even possible?? Yes, Sheila, it's incredible that we SLEPT in those things. My flat-top with the ducktail in back required both Brylcream (A little dab will do ya) and Butchwax for the front, which had to poke straight up. I have no clue who we were emulating -- James Dean? It's frightening but my hair has essentially looked the same since I was about 6 years old. My mother cut it once and I looked like Scout in To kill a mockingbird. took me years to get forgive her. I do remember pink gel and pink tape to make my bangs flat. The gel was called Dippity do and when it dried it left flakes that looked like dandruff. must have been so attratcive. And can I just say, I'm so glad that Esperanza..whoever she is...won? I can remember going to the hairdresser in seventh grade with my mother. I wanted the cut where the hair was longer in front than in back and fell forward like a sheet. At my mother's insistence, I came out with a pixie cut. Like Ro, took me many years to get over that! We also used to get home permanent waves. My sister and I had to share a box of Toni--remember that awful smell? I am continually tormented by any long hairstyle. Julia Roberts, Jennifer Aniston ... all I've ever wanted was long, thick curls. You'll probably guess my hair is thin and fine (and stick-straight). I can't do anything even at shoulder-length. On the flip (pun intended) side, I can rock a short bob! Hallie, I'm not kidding. I thought that was a photo of me. I had to look twice. How did I look in high school? EXACTLY like that. Dippity Do, yes. Big rollers with picks, ow, yup. Shower cap hair dryer, yes. Which I sometimes used with just the hose, and a roller, the prehistoric equivalent of a blow dryer, come to think of it. Aquanet hair spray. And there was some stuff in a glass bottle that you dipped a comb into--it was...weird viscous stuff and it was called..um...rats. I almost can think of it. Tammy,we ALWAYS want the kind of hair we don't have, right? I would have "flipped" to have straight hair. The only thing that tormented me more than my hair was my nose. And no one better say, "Oh, but you have a nice nose!" Let's just say I've grown into it. Oh, Jack - flat top! Always very virile I though. And the duck tail! Didn't that do eventually grow into the mullet. Hank,Ro - Yes, Dippity Do! That's probably what I used to plaster the Guiche curl to side of my face. And Hank, that's so funny because I got an email from a high school friend who saw the photo who insisted I'd used a picture of her! For years I wanted an updo with curls, like Cinderella. My mother finally indulged me one day by sending me to a hairdresser to get "the look". It was a southern beauty shop--they gave me a giant beehive (I had really long hair) with swirls around the edges. By the end of the afternoon, the thing had listed to port side, then collapsed. I looked like Mrs. Frankenstein. I had to go back the next day to get all the teased-up tangles removed. That was the end of my Cinderella phase. Kathryn, I'd have killed for those curls. Cinderella, indeed. That's something else to talk about -- regional hair! Does it still exist? Oh Hallie, that photo is priceless. I just can't imagine you with that hair in real life. I actually just got over my first experience with hair torture. This whole STRAIGHT HAIR trend has been killing me. I don't have the patience or hair fortitude to blow my hair dry straight. I just can't pull off Hank's hairdo. Anyway, my hairdresser put an end to my pretensions. And I'm back to scrunching my hair with my fingers and letting it be wavy. It takes half as long to get ready, and looks twice as full and healthy. I have the same hairstyle I had junior and senior year of high school. Wash, brush, walk out the door. However, I am an Irish dancer. With my straight hair, I have to spend over an hour curling my hair to achieve the desired ringlets. I found the best method for my thick hair is using bobby pins to do pin curls and lots of curl spray. Melissa - let's just say you were lucky about WHEN you were in high school. I always wondered about those bouncing ringlets on Irish step dancers. As a kid I wanted long, curly blonde hair like one of my classmates. No way I was going to be allowed to dye my hair, but I did have the curls and my mother said I could grow it long when I was old enough to take care of it myself. I let it grow from sixth grade through high school graduation and it got wispier and less attractive with every inch and never did get longer than about four inches below the shoulders. No blow dryers then, so for school I wore it in two ponytails. For special occasions I rolled it in jumbo rollers for a whole day before, then used that spray-on "shampoo" to keep it going for a couple extra days. Finally got it cut for college and came to appreciate the wash and wear blessing of short, curly hair. My middle son likes to let his hair grow long every summer and it drives my husband and mother-in-law crazy. I keep quoting the headmaster at the high school my brother attended in the 70s when parents wanted him to ban long hair and sideburns. (The school was run by British monks.) He said, "Hair is not a moral issue." He might have added that most of those guys would also be wincing over their yearbook photos with the lanky locks and mutton-chops. Has anyone seen the Chris Rock documentary on hair? This entire post and the comments are a riot. Hallie, your description of the bonnet hair dryer sensation is so evocative: it "felt like a thousand red ants feasting on your scalp." My two sisters have curly hair and my mother was determined that I would, too, if it was the last thing she ever accomplished. Each morning she'd corral me next to the sink and glop that stuff on my hair. On my walk to school, I'd use my hands to un-wave it. In truth, I've never been much of a hair trend person. I was a tomboy, so a pixie worked well under my ballcap, and while I went through the long-and-straight stage in college, I've gone with short and simple most of my life. And once I came of age, no Nestle Superset Wave Lotion. Ever. Back in the day, I always had what my mom called a 'bob'...which of course never quite worked since my hair tended to wave and curl in the oddest places. Finally, when I was a sophomore, I managed to get my hair shoulder length in an imitation of Shelly Fabares. It lasted a week before I was dragged to the salon for---gasp---a professional permanent wave. The day BEFORE class pictures. The next day it rained...let's just say I looked a bit like Orphan Annie, only brunette. My hair has been short ever since (not quite as short as Dame Judi Dench, but close). However, short does not mean not using rollers...and those wire ones were killers. And I could never find all those little pink picks. Blamed my sister who, for some inexplicable reason had long long long hair and never had to have a perm. Ever. For torture--the younger Meg Ryan. How could hair that messy still look so cute? I had to add another male perspective to this great topic. Going through grammar school in the 80’s I have to admit I had a mullet since it was all the rage. And I managed to pull it off with the Catholic School dress code by tucking it into the back of my collar. Dippity Do was also in my arsenal. I’ll spare everyone the rest of the horrendous details. We used beer as setting gel and orange juice cans. The Farrah was all the rage in college. After that, I gave up. I have a lot of hair but it is very fine. Trying to keep any body in it is a lost cause...or was until I finally went silver. Nice to know gray hair is good for something, lol! I've had short, wavy/curly hair all my life. When I was a child it was very blonde and people...total strangers...would stick their hands in my hair and then be surprised that it was soft. Over the many years it has gotten darker and thicker, but it is still very short and soft. I can assure you that MY ducktail never grew into a mullet. But I came back because I remember my hair looked exactly like Ricky Nelson's on Ozzie and Harriet. And I watched the TV show every week to make sure. Missy wrote: ".total strangers...would stick their hands in my hair and then be surprised that it was soft." Reminded me of how, when I was pregnant, complete strangers thought it was ok to give my belly a feel. They were surprised that it felt hard as a basketball. I was too polite back then - have since gotten over it. Jack: Oh, I had such a crush on Ricky Nelson and his hair. I always wondered how hard that -- pompadour? jelly roll? what do you call it?? -- was to achieve. Bob, I'm picturing you in a mullet! Now I keep it short and clean. And the unfair thing is that I produced four children with gorgeous heavy wavy hair! I had that Dorothy Hamill cut in high school! My hair was right for it, but the shape of my jaw, less so. Does anyone remember 'Sun-In'? You sprayed it on and it was supposed to give you naturally sun-streaked hair. My sister and I used it like mad one summer, and all we got for our trouble were orange patches. I did the big curler thing too. The bane of my youth (up to age 40!) was having my hair professionally done. The average hairdresser would fall back on "teasing" my heavy, straight, unmanageable mop, and I'd come out looking a Jersey girl from out of the fifties. I actually had one hairdresser tell me I had "hair like a horse." I eventually fell back on a reliable (short) cut from a family member. I admit not having not set foot in a beauty shop for years. Julia, I'm trying to imagine you a la Dorothy Hammil. If you've got a picture email it and I'll put it in the blog tomorrow! Hank, do you have yours? Deborah? Anyone else?? Julia, as a California girl I knew from Sun-In. My daughters used lemon juice and got nice blond streaks in their auburn tresses. Oh, Sue Ellen - hairdressers really have progressed since those dark days. So this is, apparently, my Haarschmerz -- this "do" I have now. OMG...Sun-in. Never really worked on dark brown hair - but i tried. 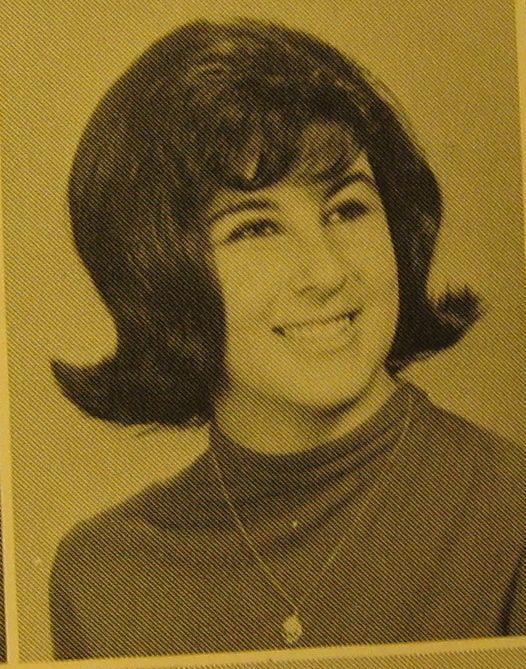 Hallie, there was a pic of marlo Thomas on AOL today and she had the same hair you did. Those are interesting hairstyles discussed, almost makes me glad that in junior high we - girls were REQUIRED to have short hair. One inch above the collar. And if you wanted to have long hair, then you applied for permission with the principal who would decide whether to grant permission to you or not. I only remember seeing one girl with beautiful long hair during my years in junior high. I think she only lasted one semester before she chopped it off to have short hair like everyone else. By the way, the hairstyle had to be within the approved range of hairstyles for short hair. And of course, it had to be STRAIGHT. No perms, curly hair… One girl in my class had curly hair. She said it was natural. The teacher said it was perm hair. Guess who won? Three points for those who say it was the teacher. Another three points for those who say the student eventually had straight hair. I have my suspicions of why and how the student with curly hair became a student with straight hair. I have straight black hair. During my junior high school years, it was short straight black hair. Actually, come to think of it, no, I am NOT glad that in junior high girls had to have short hair. I did the flip thing on those rollers every night but I took the brushes out and pinned them with large Bobbi pins so I could sleep. Hubby did the ducktail thing with Brilcreem. Funny thing is he pretty much wears he hair that same way. Its just a tiny bit thinner and he's just starting to gray around the ears.